Italian ballerina Elisabetta Terabust, who died in February this year at her home in Rome after a long illness, was a star of the London Festival Ballet, now English National Ballet, from 1973 until 1988. ENB dedicated this season’s performances of Kenneth MacMillan’s The Sleeping Beauty to her memory. 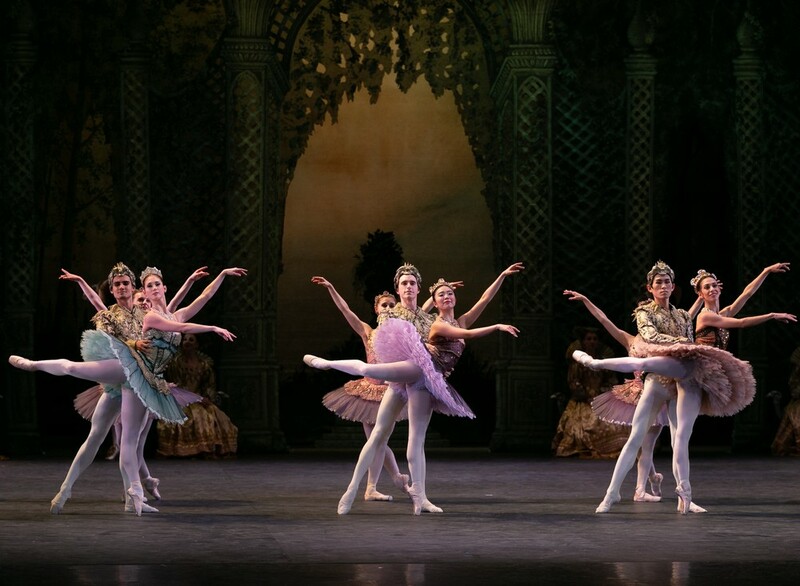 Alina Cojocaru was Princess Aurora, Joseph Caley played Prince Désiré, James Streeter was Carabosse, and Shiori Kase the Lilac Fairy. It’s not the newest production in the world, nor the most lavish, but Kenneth MacMillan’s version of The Sleeping Beauty for English National Ballet gets so many things right. First and foremost, the cast’s attention to stylistic detail. To tell this fairy story convincingly you have to lead your audience into a particular and elaborate imaginative realm. If the conventions are not observed, the illusion never takes shape. In this production, everything comes together. The soft, leafy greens and misty golds of Peter Farmer’s painted set, Neil Austin’s numinous lighting, a heartfelt account of Tchaikovsky’s beautiful symphonic score from the orchestra under the baton of Gavin Sutherland, and dancing that, if at moments flawed, evinces an absolute commitment to classical style and stage manners. At the heart of The Sleeping Beauty is its heroine, Princess Aurora. The company put on half a dozen casts, but the first night of this revival belonged to Alina Cojocaru, returning from maternity leave to reveal again all those qualities that have illumined every role she has ever danced. She’s 37 now, but that artistic maturity is coupled with the most convincing youthfulness in her portrayal of the 16-year-old princess greeting a quartet of suitors. Unaffectedly gracious, radiant, Cojocaru makes those testing balances of the Rose adagio seem like a natural expression of her character. Her perfection in detail and effortless fluency carry all through the ballet. Joseph Caley was an admirable partner as Prince Désiré, dancing nobly and gauging his character well. Shiori Kase was a warmly benevolent Lilac Fairy, James Streeter a seething force of wickedness as Carabosse (white-faced and red-wigged, like Elizabeth I), and Rina Kanehara and Daniel McCormick made light work — in the intended sense — of the Bluebird duet. The company performance takes a while to warm up, with some cautious dancing in the Prologue. But I love how the whole company gets caught up in both story and dancing in this production. When James Streeter, imperious as the bad fairy, confronts Shiori Kase’s pearly Lilac Fairy, the whole court watches them with wonder and fear. This is a world where formalities matter, where forgotten invitations can lead to disaster. In the hunting scene, we see both the aristocratic elegance of the court’s dancing, and the strict sense of hierarchy in its games. The corps de ballet dance with assurance, particularly in the vision scene. The production overall is one to savour, despite a few pedestrian ensemble dances. Such shortcomings were balanced on opening night by polished work elsewhere, especially from Daniel McCormick and Rina Kanehara in the Bluebird pas de deux. Plaudits, too, to Gavin Sutherland’s spirited conducting of the company orchestra, which does full justice to Tchaikovsky. why hasn’t there been any mention about Maria Alexandrova’s performances of Sleeping Beauty earlier in June of this year? Yes, I haven’t read any reviews either. Maybe there are some out there. She’s such a strong performer. I don’t see her as an Aurora, but would like to read what others thought of her performance.